Dogwood Acres is located at 439 West Central Avenue Davidsonville, MD 21035 near the intersection of Highway 214 and Brick Church Rd. We proudly serve the Davidsonville and the Edgewater areas as well as Annapolis, Baltimore and Washington, DC. Dogwood Acres has been providing premium pet care and peace of mind since 1997 when Kurt and Audrey Reichardt opened for business. 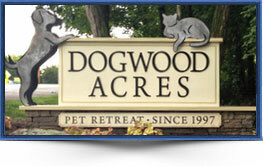 They opened Dogwood Acres out of the desire to provide a quality pet retreat for their beloved Black Lab, Casey.